Fans of Xboxliveaddicts will be long familiar with Black Rock Studios previous work. Better known as Climax. They developed some of the most popular MotoGP titles to date. After handing over the licences, Disney Studios purchased Climax and turned them into Black Rock Studios. They then got to work on the well received ATV freestyle racer Pure and whilst we were all amused with Pure, the studio was secretly creating another type of racer, that game, is Split/Second. 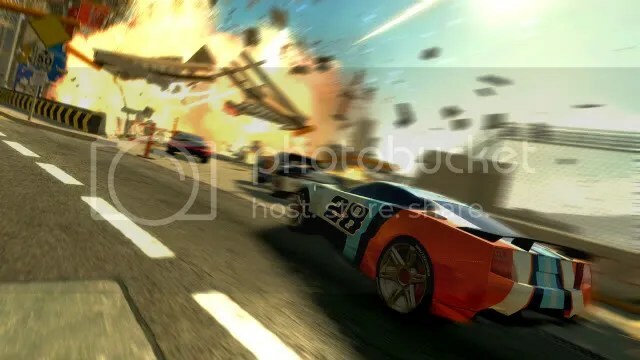 Click here to read my exclusive preview of Black Rock Studios explosive new racer Split/Second. To really get a full experience of Split/Second, you need to play it. The recent demo which was released didn’t really do it justice, some races could be really intense with things happening everywhere, but some could be rather tame, and if the player had gotten used to how the car handles, races could be very uneventful all the way out there in front. Which is why when I was invited to play with a room full of other community sites and the games developer and publishers, I was immediately presented with how awesome this game truly is. If you’re not fully aware of what Split/Second is, it’s the newest racer off the block from MotoGP original developers Climax, now known as Black Rock Studios, who kept us impressed enough with ATV freestyle racer Pure to sneak in production of their latest project Split/Second. An arcade racer set within a television show where racers can trigger things within the race track, to gain the edge on the race. Here, your environment truly is your weapon, with a staggering amount of different options to take out your opponents, all as visually beautiful as they are dangerous if you’re on the wrong end of one. The single player has a large season play, but multiplayer was what I was really there for, 8 players in a room, and we got right into some of the racing. With your typical racer, the main game type is, your simple circuit racing, only you’ll be fighting for first with the vast array of environmental hazards at your disposal, some unique and special to the tracks. Along with this type, there is also elimination, where after 60 seconds; the player in last is eliminated until its just one racer left standing. These two race types alone, will keep you going for hours on end but to mix things up a little, is the addition of Survival Battle. When told what Survival Battle actually was, it sounded impressive; the thought of racing around avoiding explosive barrels earning points seemed entertaining enough. It wasn’t until we started the race were we understood how daunting it actually is. Around the race track, driving along with you, are massive 18 wheeler trucks, which are firing red and blue barrels from behind. The blue barrels will throw you about a bit and make you lose control a little, but the red ones will out right ruin you. Overtaking these brutes is what earns you the points, and it’s a race against time to be the one with the highest amount of points. 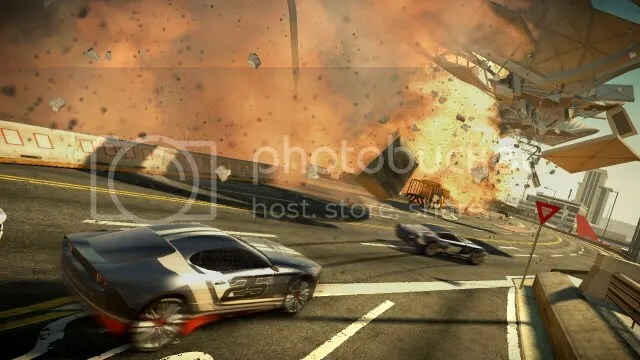 Whilst speaking with the developers, they brought up the fact they watched a lot of Hollywood films in the hope to really capture those moments that make films great, examples of where the idea for explosive spouting juggernauts came from that of films like Terminator 2 and Dark Knights underground tunnel scene. The cars all come in a variety of colours to choose but what’s quite a cool feature to note out is what they’ve also implemented into the decal system. Achievements you unlock and earn whilst progressing through the games will appear as small decals added to your vehicle of choice, giving other players a little heads up on what they may expect. As well as this, your racing number online will start at 99. The more races you win and the better positions you come, your number will slowly whittle down until you reach number one. This, along with the achievement decals, act as a calling card for other racers so they know what they’re up against. Similar to Burnouts ‘one to watch’ at the beginning of each race. But don’t let races slip, or your number will slowly work its way back up. Coming in out in just under a week, Split/Second is a sure hit for all racing fans, with intense racing and some spectacular game modes to keep you going if race isn’t enough. We can’t wait to get our hands on the full game, and neither should you! It was a hidden gem back at E3 with some insane and fantastic trailers released after, but Split/Second stole the show for me at Eurogamer this weekend. The games over the top out look on an action packed racing game based around a television show, the beautiful visuals throughout, whether it be the sun glare on your car to the piercing explosions from the towers above, Split/Second has a new way of focusing on racing, this takes track deformation to the limits and the possibilities are infinite when it comes to a unique racing experience each and every time you race. In the session I had with the developers we discovered some pretty impressive points about the sound in the game and of course the history of Black Rock Studios (Pure/MotoGP) as well as a sneak peak at a new racetrack which looks awesome. 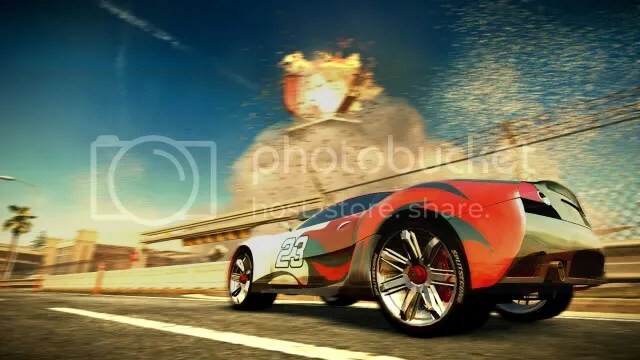 Keep everything peeled for Split/Second features coming soon on Xboxliveaddicts! Click here to see my youtube video of the live footage!